To build an effective and scalable solution, developers need technology that can be deployed around the world and still provide results with high confidence. To that end, we’ve spent the last year investing in making our Cognitive Services enterprise-ready and bringing them to general availability, ready for production use. Cognitive Services are a set of intelligent APIs and services that are used by more than 1.2 million developers and thousands of businesses throughout 150 countries across every industry from retail to healthcare to public sector to manufacturing and non-profit organizations. We’ve deployed more services into the Azure data centers around the world, written more documentation in multiple developer languages, re-architected products to change the way we store and retain data in order to give controls to users over their data, adhering to the highest standards available. We’ve localized our services into multiple languages across the globe with over 10 of them now available in 15 languages. All while meeting strict SLA standards that we require for every Azure service. And we’re not stopping there, our work continues. Just recently we’ve refactored our speech services and are launching a single unified speech service accessible via one endpoint to enable high speed (low latency) speech interactions. We expect that this will enable you to be more successful meeting your business needs with speech. Speech service – A single endpoint for all Azure Cognitive Services speech capabilities. Use one Azure key to access all speech services around the world. Speech to Text – Benefit from updated and improved models, deployed to new Azure data centers and full compliance with ISO, SOC and HIPAA, as well as 17 new languages for a total of 30 languages available now. Customize your models and boost accuracy right within the service. For call centers, you can count on high-quality transcriptions. Text to Speech – Create an end-to-end speech recognition app for global audiences. Speech Translation – For customer support bots, make a request in your language and have it translated into different languages. Custom Voice – For conversational AI, use your own voice with our custom voice font in your preferred language. Natural Digital Voice in preview – For those early adopters wanting the most advanced technology, check out our natural digital voice, or Neural Text-to-Speech (TTS) service. Neural TTS is ground-breaking technology that makes speech synthesis sound natural and nearly indistinguishable from human recordings. By using Microsoft Neural TTS, you will see significantly higher quality and accuracy as well as making speech synthesis closer to human parity. If you are interested in the preview of Neural TTS, please submit a request. Speech Devices SDK in public preview lets you optimize audio capturing on your own hardware that connects to our speech services. Another exciting area we’re investing in is Cognitive Search. Our customers today have expressed the need to optimize workflows, reduce manual labor inefficiencies, process large volumes of complex data, and derive insights across siloed environments quickly and accurately. We’re building systems that will automatically do this across all your data regardless of format, so you can easily gain new insight from your data. 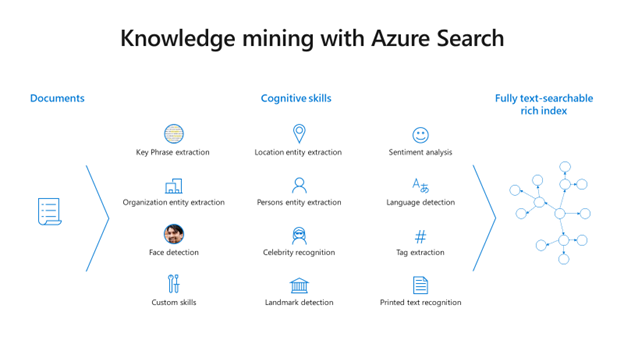 With Cognitive Search, we combine the power of Azure Search with Cognitive Services such as Text Analytics and Computer Vision to analyze and identify the important entities within your documents. You can also extend the platform by bringing in your own Custom AI skills to enrich your data and extract additional business-specific insights. The solution is already used in large enterprises of all industries to improve understanding and processing of large documents with greater speed and precision. Since we first made this capability available in preview in May we’ve seen thousands of developers in over 100 countries use it, running millions of AI skills over their data to extract knowledge and gain a deeper understanding of their business. We think that AI at scale is the future and we’re investing in enabling that for you. I invite you to learn more about Cognitive Services here and don’t hesitate to let me know if you have any questions about building your own AI system using Azure. Find out more about Cognitive Services and try them out yourself.